The Fat Cat Realtree APC Pink Camo soft tip darts are designed with high quality, nickel silver plated barrels which offer exceptional balance and styling in a slim profile. Having a slim profile dart barrel is necessary to obtain a closer grouping of darts to maximizing scoring. Intended for use with electronic dartboards and are ideal for casual-to-intermediate level players. Each barrel has strategically placed knurled bands, deep grooves and rings that make excellent gripping points and encourages consistent hand placement. 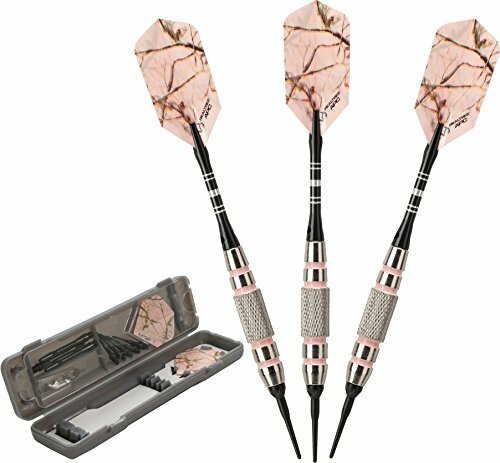 Fat Cat APC Pink Camo darts are equipped with heavy-duty, lightweight aluminum shafts with locking holes and diamond-cut etchings. Locking holes in the shaft allow for a tighter fitting to the barrel that improves stability and greatly reduces the need to retighten during play. Quality flights help increase speed and reduce drag, producing a consistent flight path for pinpoint accuracy; detailed graphics are prominently displayed for added flare. These darts feature 2BA Tufflex Tips II soft tip dart points that have a reinforced cone, making them extremely strong and durable. Simply twist for a tight, secure fitting and easy removal. The barrels are compatible with all 2BA sized corkscrew thread dart points. These darts include an additional set of convex nylon shafts, flights, 2BA dart points and a dart mechanic wrench. The Fat Cat APC Pink Camo darts and accessories are fashionably stored and protected in the slim-profile, hard-shell case.